This article has been republished for exclusive use by The Grey Muzzle Organization with the permission of original author, Adam Clark, LSW, AASW. Adam Clark, LSW, AASW is a published writer, educator, and adjunct professor at the University of Denver’s Graduate School of Social Work. 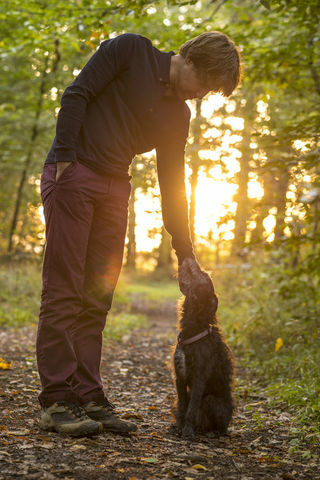 The pain of grief is uncomfortable for many, and it can be extremely hard to know what to say, or do, in support of someone around us that is grieving the loss of their pet. Whether they are a friend, family member, or acquaintance, we struggle for the right words, even if you are a fellow animal lover. Many loving pet parents have heard the words it was just a pet, you can always get another one (a common cultural stigma faced by people grieving the loss of their pet) from well-intended and well-meaning friends. Such statements; however, can rip at the core of one who is grieving and who may have considered their pets to be just as important as children, and members of the family. 1. Say, "I can't imagine what you are going through right now." Reason: Although everyone experiences grief, no one can know exactly how another person is feeling. It can be hard to hear things along the line of "I know exactly what you're going through," as it assumes you may know best. It doesn't allow your friend to tell you themselves what they are going through right now, and how they may be feeling. 2. Say, "I'm here if/when you need me." Reason: In the acute phase of grief, or period right after a death, a person grieving for their pet may want comfort and at the same time, and might want to be alone. It can be hard to recognize what is truly needed until emotions are processed, as grief can be all-consuming. Reminding your friend that you are available for them can be a comfort throughout this time. Remember to only say things that we mean... if we aren't going to be available to them, due to time constraints, discomfort, or avoidance later... don't say it. 3. Say, "It makes sense that you are grieving so much, considering the bond you shared." Reason: This shows that you recognize the importance of the bond between humans and their companion animals. It also normalizes the experience for your friend, telling them you are a safe place to talk about their grief. 4. Say, "[Pet's name] isn't judging you for making decisions for them, they loved you too much." Reason: Many pet owners feel guilty and can easily second-guess their actions and place undue amounts of shame for the decisions they may have made. Having to make the choice of euthanasia can add to these feelings and leave your friend wondering if they made the right choice, or if their pet is angry with them for the choice they made. 5. Say, "The love between you was immense, I remember when..."
Reason: Recognizing that there was a loving bond present, and saying so from your own perspective, can bring comfort. Bringing a loving story to mind in your own words can remind your friend of the good days shared and the beautiful memories that were created. It also reminds your friend of the impact their pet had on others. 6. Say, "Have you eaten recently? I'd love to get you something." Reason: It is incredibly easy within the grief process to reduce, or stop, eating altogether. It's important to check-in with your friend, in a supportive and non-judgmental manner, to make sure they are still meeting basic needs and engaging in self-care within the grief process. If said supportively, this can bring comfort in the fact that someone cares about their well-being. Offer to bring something to them, but don't just bring it. Allow the choice. Bonus: Say, "It may be hard the first time you go to the park, or for a walk. I'd love to join you if you feel that may help, whenever you're ready." Reason: "The firsts" are incredibly painful milestones that all grieving pet parents process through. The first time you visit the park alone that you used to let your dog chase their favorite ball and play with so many four-legged friends. The first time you walk that familiar route without your companion. The first "gotcha," or adoption day, and birthday. These times can trigger, or bring about suddenly, intense emotional grief and the pain of loss. Offering your presence can be the best thing you can do, especially in the beginning. Just be sure not to take it personally if your friend isn't ready for that support, as some find more comfort in processing through alone. About the Contributor: Adam Clark, LSW, AASW is a published writer, educator, and adjunct professor at the University of Denver’s Graduate School of Social Work. Adam focuses his work on the psychology behind the human-animal bond, specializing in endings and transitions. He is passionate about reducing the cultural stigma associated with pet loss, supporting pet owners, and educating veterinary professionals. Additional information on Adam and his current projects can be found at www.lovelosstransition.com, or he can best be reached at adam@lovelosstransition.com.